Samsung and HTC have launched their latest flagships, and the two devices have very different roles and aspirations. While Samsung hopes to maintain its position as the undisputed king of the Android hill, HTC is hoping to claw its way back into a market it dominated only a few years ago. The age old battle of plastic vs metal comes to the fore once again, but both devices have a lot more than just build material and quality to offer. It’ll be quite interesting to see how they stack up against each other. 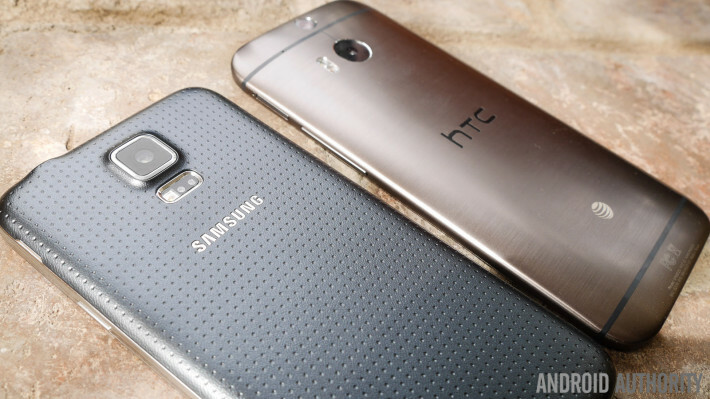 Here’s our look at the HTC One (M8) vs Samsung Galaxy S5! From the first glance, the two phones could hardly be more different, and that extends beyond the contrasting materials they are made of. Also obvious is that the two phones closely resemble their predecessors, a trait that you may or may not appreciate, depending on how you felt about the Galaxy S4 and the HTC One (M7). The Samsung Galaxy S5 comes with the signature plastic build that, for better or worse, became associated with the name of the series, with a twist offered by the dimpled texture of the back cover. 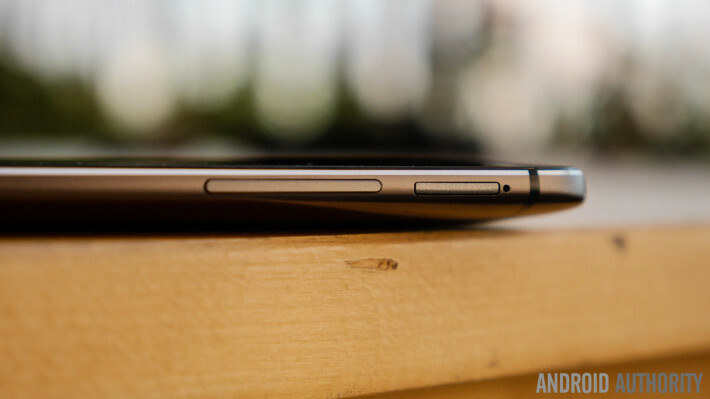 The form factor is largely the same, but Samsung opted for a less rounded general shape compared to the S4. You get the same button layout on the sides with the volume rocker to the left and power button on the right. Of course, it wouldn’t be a Samsung device without a physical home button on the front, this time featuring an integrated fingerprint scanner. The home button is once again flanked by two capacitive keys, but now comes with a Recent Apps key instead of the Menu button from previous iterations. This is definitely a positive change, that allows for a more traditional multi-tasking experience. The sides are ridged, but they’re still flat enough to feel good in the hand. The biggest change, when it comes to the design of the Galaxy S5, is of course the back cover, which is still plastic, but features the already well-known dimpled design. It’s probably the most polarizing aspect of the design, as many view it as a setback even from the faux leather texture of the Samsung Galaxy Note 3. Moving over to the HTC One (M8), you will find subtle but important changes to the aluminium build compared to what was found with the original. In the gunmetal grey version that we have, you get a hairline brushed look on the back that does point towards fantastic build quality. The HTC One (M8) will definitely turn heads and manages to look very executive in the process. Another noticeable difference at the back is the addition of a secondary camera at the very top of the back, the Duo Camera that helps with capturing depth data. The big change with the aluminium body is that it now wraps around the sides of the phone, eliminating the polycarbonate that used to be there, and allowing for a smoother and more rounded look and feel, that is definitely an improvement from the more rigid feel of the original. The top of the phone is the only place where you’ll find a polycarbonate strip, which houses the IR blaster and the power button. You might not like the placement of the power button, unless you’re moving from another HTC device, but nonetheless that aspect returns here. Finally up front, you get a larger 5-inch screen, and also making a return, the great performing BoomSound speakers at the top and bottom, making for a taller device all around. While the HTC One (M8) is definitely the taller device, it is also just a bit narrower than the Samsung Galaxy S5. Reaching across the phone from left to right is easy on both smartphones, but the 5-inch+ form factor makes it quite difficult to reach the top while using either phone in one hand. The shorter Galaxy S5 gets a nod for making things a little easier. To conclude, handling and build quality are good on both devices, and it all boils down to what material you prefer and which one looks better to you. Competing display technologies have come a long way, and we see just how far with these smartphones. 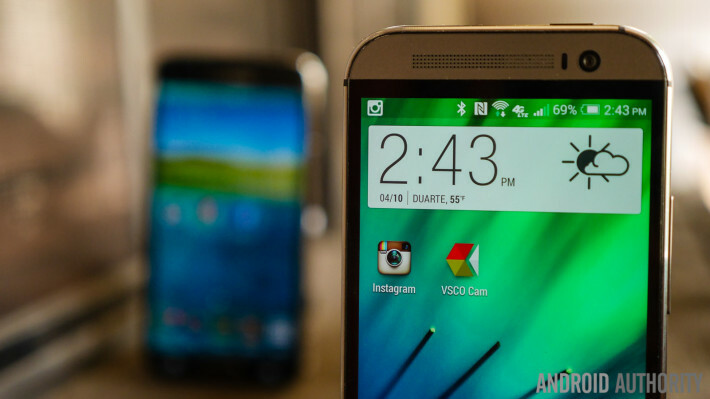 The Samsung Galaxy S5 features the classic Super AMOLED display at 5.1-inch, while the Super LCD 3 screen of the HTC One (M8) is now 5-inch, up from 4.7-inch on the M7. Super AMOLED brings the signature high saturation with colors that basically pop out of the screen. You’ll certainly get an incredibly vivid experience with the Galaxy S5, with no loss of clarity even at steep viewing angles. After all, DisplayMate praised the display of this smartphone, noting it has the highest brightness, lowest reflectance, and highest colour accuracy of any phone, among other accolades. That being said, the Super LCD 3 display of the HTC One (M7) was no slouch, and it’s even better on the 5-inch One (M8). It also has great colours, highlighted by the new motifs in Sense 6, and viewing angles are as always, fantastic. If we were to nitpick, we would say the One (M8) seems to show a little better contrast between colours upon closer inspection, but there is no doubt in our minds that you’ll have a great time playing games and watching videos on either display. Performance is another instance where either device will give you a really great experience, as both feature the best processing package currently available. You get the quad-core Qualcomm Snapdragon 801 on both the Western version of the Samsung Galaxy S5 and the HTC One (M8), with the former clocked at a faster 2.5 GHz, compared to the 2.3 GHz of the latter. Backed by the Adreno 330 GPU and 2 GB of RAM, you should have no trouble getting anything done on either of these phones. While you always hear that TouchWiz lags, the incidence of stutter is lowest on the S5, a testament to both the specs and the optimization of the software. That’s in spite the fact that TouchWiz is once again packed with features to help you get a lot done, sometimes all at once. On the other hand, the HTC One (M8) works with a version of Sense that is even more streamlined. While it may not provide as many features, it’s a good example of how keeping it simple keeps it fast, something that is apparent in this snappy and smooth user interface. Either way, if you want a fast phone, you get one no matter which one you pick. With the Samsung Galaxy S5, the removable back cover gives you access to a removable 2,800 mAh battery and the microSD card slot. Having the peace of mind that comes with those features is definitely one of the biggest benefits of choosing the S5. In the name of durability, the Galaxy S5 comes with an IP67 rating for protection against dust and water, which means that, along with almost complete dust protection, the phone can be immersed in up to 1 meter of water for as long as 30 minutes without a negative effect on functionality and performance. You do have to make sure the back cover is properly in place and that the flap over the microUSB port is closed, but these are very minor inconveniences considering the benefits. And finally, when it comes to battery life, I found the phone capable of handling heavy usage comfortably over a 12 hour period of time. Especially with the power saving features it offers, you should easily get a full days use out of the Galaxy S5, and of course, have the option to replace the battery on the fly if required. Moving over to the HTC One (M8), it may not have a removable back cover, but it now features a microSD card slot on its right side. The lack of expandable storage has been one of the biggest gripes with previous HTC flagships, and it’s great to see the company finally taking notice. HTC put its own spin on the sensors game, making the phone able to tell when you raise it up for use, and then register touches and swipes to activate the phone. It’s an elegant way of getting into the phone without needing to reach for the power button located at the top of the device. You are also able to control your television and set top boxes with the HTC One (M8), using its own Sense TV remote app. There’s little to say about the speakers on the back of the Galaxy S5. They provide a pretty one-dimensional sound, and they pale in comparison to the enhanced BoomSound speakers on the M8, with their louder, deeper sound. When it comes to the battery of the One (M8), you may get a slightly smaller 2,600 mAh unit, but you should have no trouble going from dawn to dusk, and even further if you use the power saving features of the phone. HTC and Samsung go head to head with their differing philosophies of the camera experience. Samsung did away with some of the many modes on the Galaxy S4 app, and added a few key ones, such as Live HDR and Selective Focus. Live HDR is nice to have when you want to see if shooting in HDR will actually improve your picture. Selective Focus combines multiple images to give you a customizable level of focus; it works well when executed properly, but that definitely doesn’t happen every time. Samsung’s new 16 MP ISOCELL camera uses updated tech to improve general image quality, and the result is a camera that yields vivid photos with good levels of detail. HTC decided to stick with the 4 Ultrapixel camera that was included in the original HTC One, but this time with an interesting addition. The Duo Camera adds depth information to every shot, and while it eliminates the amount of processing time found in the Galaxy S5 implementation, it’s just as much a hit or miss situation. Many pictures have an obvious area of blur that the software wasn’t able to correctly process, making the line between foreground and background fuzzy. Other modes available include Zoes, which are still pretty fun to use and are available for anyone that wants to create nice memories while taking this camera out. Unfortunately, there are limitations to a camera with such a low megapixel count, and it definitely shows when you zoom into any photo, through grain and lack of details. Pictures also tended to be washed out, and lacked dynamic range in my testing. But if you are happy with what initially comes out, then you’ll be able to utilize the pictures from the HTC One (M8) for social media and such without a problem. We’ll be bringing you a full comparison between the cameras of the two devices in the following days, so stay tuned. This is an interesting part of the comparison, as there are two very different philosophies at work here. One tries to add to the formula, while the other just wants to optimize what’s already working. Starting with the Galaxy S5, TouchWiz brings relatively few updates to what was already a feature-heavy software suite, as well as some cosmetic changes. We’ve already covered the heart rate monitor and the finger scanner in the review and feature focus videos in detail, so we’ll look at some of the other features here. The redesigned Recent Apps screen is accessible through the new capacitive key, replacing the Menu button. The change is welcome, as it brings the UI in line with the majority of new Android devices. Most features are accessible from the re-designed power toggles section in the notifications menu, which, like the new Settings section, features brightly colored round icons. Perhaps the biggest change is the introduction of My Magazine, which is essentially Samsung’s answer to BlinkFeed. While it does bring a neat news aggregation feature to Touchwiz, My Magazine is unfortunately not a robust system. It piggy backs on Flipboard, which itself is powerful, but My Magazine pulls from a very limited list of topics, making it less useful than the standalone Flipboard app. Beyond that, Touchwiz is pretty much the overlay we all know. It’s still bright and uber colorful, and may not be as bloated as before, but still manages to pack a long list of features that you may or may not use. The good news is TouchWiz has clearly been optimized for performance, which is visible even after a few minutes of usage. Meanwhile, in HTC’s camp, it’s a matter of building upon Sense, rather than extending it with substantial new features. In terms of appearance, this means some subtle changes like the addition of color accents, though you can revert to the previous grayscale look if you prefer it. BlinkFeed has also been changed a bit. There’s a new scrolling animation , and the library of sources has been greatly extended and enhanced with support for various apps, making BlinkFeed a much richer experience compared to Flipboard. The familiar Sense experience has been streamlined some more in this iteration, making for a smooth and hugely enjoyable user experience. To wrap up, multi-taskers will enjoy the slew of tools available on the Samsung Galaxy S5, while those looking for a minimalistic style and a better homescreen experience will opt for HTC One (M8). And so, there you have it, the HTC One (M8) vs. the Samsung Galaxy S5. Ultimately, they are both fantastic smartphones, but depending on your preferences and needs, several features might tip the scales in favor of one or another. If you want an eye-catching phone, the HTC One (M8) will probably be the better choice. If you’re looking for a powerful camera experience, the ISOCELL camera is a proper upgrade in the optics department. If you’re a multi-tasker, the Samsung Galaxy S5 and its large bag of tricks are ready for you. If you want performance and the ability to fly through your tasks, either phone will work well. But I will give the HTC One (M8) some points for the great media experience made possible by the excellent BoomSound speakers.